Depending on your circumstances, you may be entitled to Free School Meals or other assistance. Click to download the Spring 2019 menu. 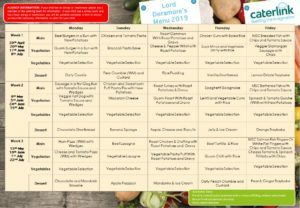 The cost of a school dinner is currently £2.15 for all children in Years 3, 4, 5, and 6. Please may we ask you to pay for school dinners promptly. School dinners can also be paid for at the start of every half term. The exact price for this can be obtained from the school office. You can also download the Allergy & Special Diet Form 2017. Children may bring a packed lunch if they wish. A named packed lunch box is recommended. Children with a packed lunch requiring a drink must provide their own. Please note that sweets, chocolate bars and fizzy drinks are not allowed. Please do not send cans or bottles into school. We have children in school with severe food allergies. To reduce the risk of an attack to these children we ask parents not to send nuts into school and children are not allowed to share food. 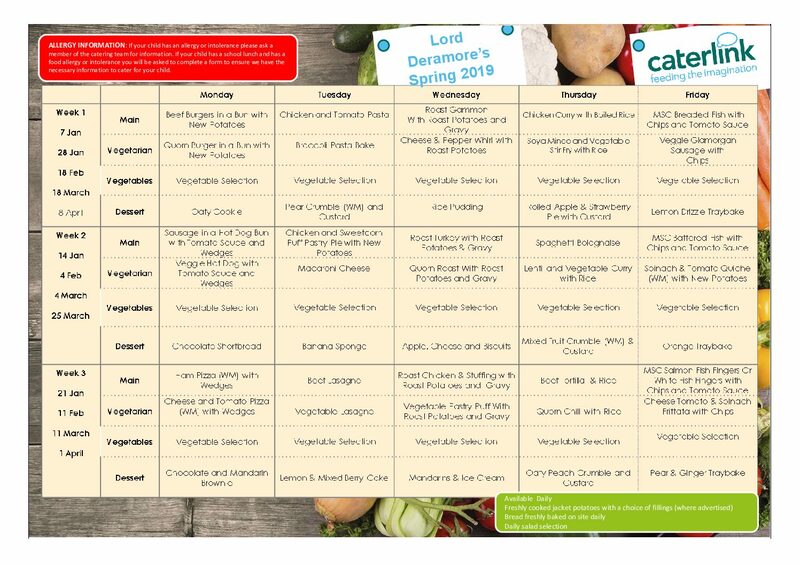 As part of our promotion for healthy eating, Lord Deramore’s School is part of a National Fruit and Vegetable Scheme. A free piece of fruit or vegetable is provided for Early Years and Key Stage 1 children each day. Key Stage 2 children may bring a fruit or vegetable snack for morning break. Children are encouraged to drink water regularly throughout the day to stay hydrated. We ask you to send a named water bottle, filled with plain water, with your child each day. Our school has registered with a milk scheme (a company called Cool Milk) which is available to all our pupils. For more information and to register your child please visit the Cool Milk website. School milk is free for all under-fives as of 1 January 2015 and is subsidised for pupils aged five or older.